Mt Horrible is a plug of quality basalt very close to Timaru. If you enjoy trad climbing on good pro and sound rock then this is the place for you. 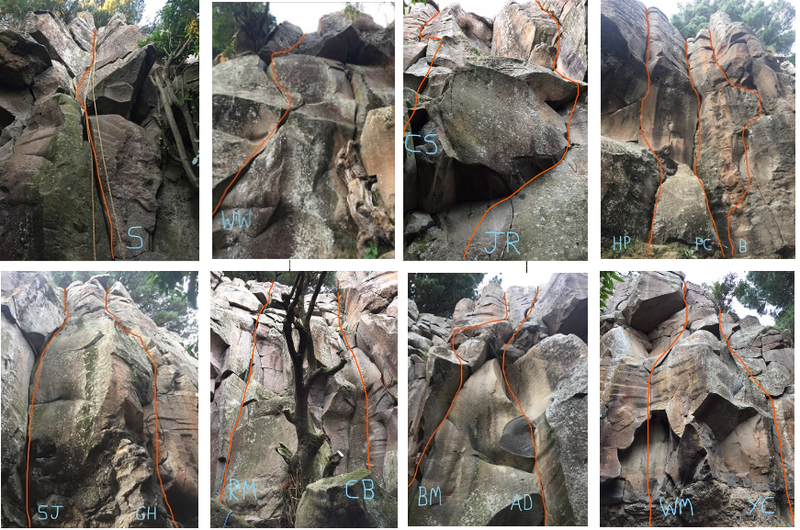 The routes are quite short but have an abundance of well-rounded holds and cracks that vary from finger width to semi offwidth. There are many other unrecorded routes that are shorter, blocky lines on both sides of the main wall. Some of these can be treated as boulder problems. Expect clean, solid rock with sound gear possibilities. Make sure you take a few quickdraws; a standard rack (a couple of large cams are useful); long slings and a single rope. The top of the crag is totally flat and user-friendly and the anchors are bomber. Since you can wander around easily between anchors, it is most efficient to set up one rope for descents. The first routes are on the far left of the main wall before it gets vegetated or blocky. Beware of old carrot or expansion bolts, it is recommended you do not use these! The basalt here is quite soft. There are a few new glue-in bolt anchors, these are good to go. The landownders are Penny and David Seyb. There is no need to contact them before climbing. Please observe the usual courtesies and show respect while climbing on their land. Just north of the Timaru city centre is an intersection with Wai-iti Rd. Turn right here and drive 4km to Gleniti. Veer left into Claremont Rd and follow this for 7km past Claremont School to Whalebone Corner (intersection with Fairview Rd). Turn left on to Fairview Rd and take the next right, which is Mt Horrible Rd. After 5km, there is a farm gate on the left , as the road flattens out. Park here but please do not obscure the gate access. Turn off just before the Pareora bridge into Pareora River Rd. After 12km, turn right in to Holme Station Bridge Rd. Turn left in to Fairview Rd and travel for 3km before turning left in to Mt Horrible Road (as above). Cross through the gate and walk along the hedge on your left. Go through another gate. Head slightly right and southwards for the next 500m to the edge of the scarp and over the swampy pond to the big pine trees on the other side of the paddock. Either use the single pine as an abseil anchor or scramble down one of the gullies to the crag. Roof of the Lh access cave. Start R and work your way L into the crack. Entertaining! 50 R of FF, "20" scratched at the base. A thin and intermiittent crack. 10m left of Dipper Mouth graffiti is a shallow gully with a rising lightening crack and a blocky top half. 8m left of Dipper Mouth graffiti climb a left-facing corner crack which turns right-facing at a second small overhang. Start just left of mahoe tree. An off-width crack leads into a good open book corner with great bridging. Double ring bolt anchor. Start up the wall and gain a wide crack, then climb through blocks exiting on another wide crack. Bidge and jam your way above the graffiti. Start on the steep and strenuous hand crack, into wide off-width crack, then finish on twin finger cracks with good bridging. Original start was on the right behind the tree (grade 15, not recommended). Double ring bolt anchor. Start behind the broadleaf tree. Climb the roof and crack from the centre of the ledge. Start behind the broadleaf tree. Easy up to a small ledge, then wide bridging and finger locks enable a move left (crux) to finish. Vegetated at the top – take care to avoid the bush lawyer. Start behind the tree just left of the Jelly Roll slab. Climb up crack and face, and up the good crack in the upper wall. Start as for Jelly Roll up the hand-crack, but at the break step left to the recessed corner-crack. Climb straight up, with a bit of a stretch through the capping overhang. The same start as JR, Continue straight up when you reach the block half way up. Up the thin finger-crack in the steep wall (first crux), then pull into an awkward rest in the pod (second crux), then move up on OK jams (third crux). Don't forget to clip into your gear as you go (fourth crux!) A classic Fearnley line. Has everything in its short height. Up finger crack tending right into hand crack. Shake out in the OK rest before launching left over the bulge (crux). Finish up wide off-width crack. The arete ot the RHS of SSJ, rejioning after 4m. No pro! Start on the series of steep and balancy finger cracks (crux). Continue up towards thin crack in corner capped by small roof. Carry out the trash start onto the block (warning: this block is looking quite detached, pull on it at your own risk), twin jam-cracks then up through easier terrian. Just left of China Boy. Start on small right facing corner (crux). Then bridge and jam your way up the obvious line past solid flakes. Starts behind the tree. Bridge onto ledge then climb the RH facing corner. Start L of Arch Dig behind a tree to gain the upward-flaring offwidth; then layback on to the arête and up to a small ledge. Step R to finish in the L crack. Up through blocky corner to the pea-pod, bridge your way out of it, then finish up the RH crack. The arete and face between AD and W. No Pro! Bridge your way up through the arch, arrange your gear, change down a gear, and then either jam (or layback!) your way up the obvious crack. Exit R to the arete with a wide crack. Starts with a nice jam crack which abandons you after a couple of metres (crux). Then it eases into a nice corner-crack. to finish. Boulder problem up face 2m R of Young Coronary. You have two choices: straight up with no gear for 4-5 metres, or step left a metre or so, place good gear and grunt through over the block. Nice moves in the upper crack follow. 50m R of YC. Follow a shallow groove onto a ledge, then use the off-width to gain the above hand-crack to exit.